A joint in which a section of a cylinder of one bone fits into a corresponding cavity on the other, permitting rotating movement, as in the proximal articulation between the radius and ulna. Also called rotary joint, trochoid joint. a synovial joint in which movement is limited to rotation. The joint is formed by a pivotlike process that may turn within a ring composed partly of bone and partly of ligament. The proximal radioulnar articulation is a pivot joint in which the head of the radius rotates within the ring formed by the radial notch of the ulna and the annular ligament. Also called trochoid joint. 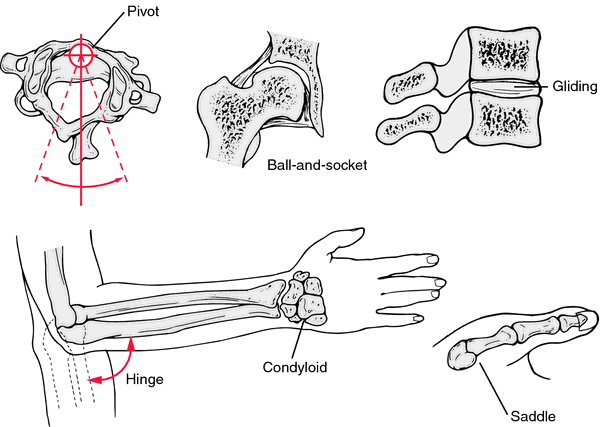 Compare ball-and-socket joint, condyloid joint, gliding joint, hinge joint, saddle joint. A synovial joint in which a section of a cylinder of one bone fits into a corresponding cavity on the other. Synonym(s): rotary joint, rotatory joint, trochoid joint.